It is generally accepted knowledge in the photographic community that hanging weight from the bottom hook on a tripod increases the stability of the system. I have even seen claims that a cheap tripod can exhibit the performance of one several times its price when weight is hung underneath it. Here we are going to examine exactly what effect hanging weight has on a number of tripods. I am going to be using the standard torsion spring oscillation method used on this site to determine stiffness and damping. In short, I set a large amount of rotational inertia oscillating on a tripod and then measure the frequency and decay rate of those oscillations. In this post, I am only going to be looking at the axial oscillations, or those that correspond to left and right camera motions. Tripods are by far the weakest in this direction and so performance changes will have the greatest effect here. For these tests I simply hung weights directly off of the tripod bottom hook using a short piece of paracord. 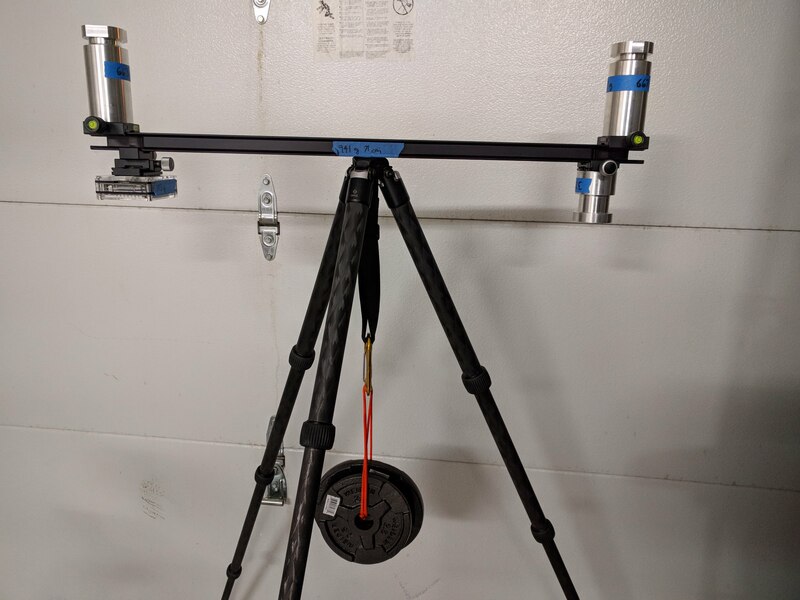 This is not necessarily the optimal way to hang weight from a tripod, but it is the most straightforward way to measure the effect. It is more ideal to let the weight lie on the ground and attach it to the bottom of the tripod via a bungee cord. This prevents the weight from swaying and inducing motion in the tripod. I was working under ideal indoor conditions and so this wasn’t a problem. Clearly the results are underwhelming. I don’t see any effect at all here on the axial rotation stiffness. Any of the small fluctuations seen in the plot above can easily be explained by noise in the data collection process. There is clearly more structure here, but that isn’t saying much. The noisiness of the measurement process is clear. 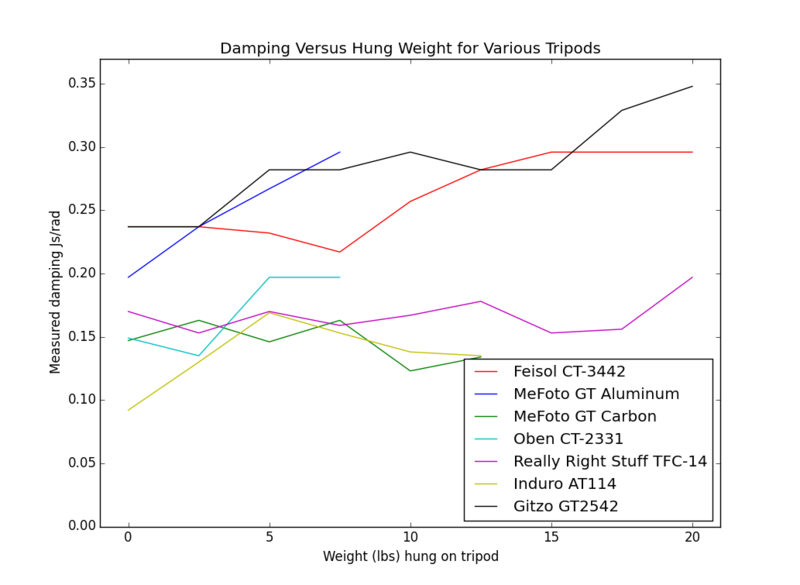 Some of the tripods exhibit what is clearly a small increase in the damping as more wight is hung underneath. But I must emphasize how small the effect is. The best tripods exhibit damping around 1.0 Js/rad. You can achieve much better damping by simply resting your hand on the tripod. 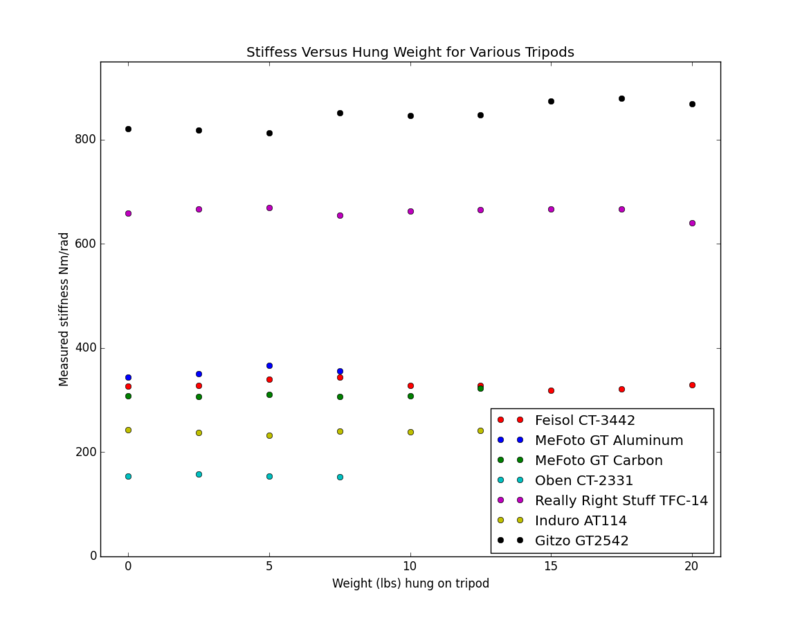 While I didn’t find any effect on the axial stiffness and very little on the damping, that doesn’t mean there are no benefits to hanging weight. It dramatically lowers the center of gravity of the system, making it much less prone to tipping over. If you are working in gusty conditions, around children, bears, or are just clumsy, a lower center of gravity can be the difference between an upright tripod and a broken camera. There could be application in which a slight increase in stiffness about the radial axis (vertical camera motions) due to hanging weight is valuable despite the lack of an effect on horizontal motions. I struggle to imagine it though. Testing for changes in stiffness about the radial axis will be the subject of a future post. the ground(backpack, rock..etc) with a elastic strap. It really helps to reduce the wobble area. Yes, having a bungee to the ground is absolutely the correct method in practice. I am hanging weight in the lab simply because it is easier to get consistency and without wind, should give similar results.